3Department of Ear Nose Throat, Central Education and Research Hospital, Erzurum, Turkey. Received 30 November 2010; revised 23 January 2011; accepted 25 January 2011.
in the consensus conference for sepsis and organ failure. diagnosed and SIRS came into existance. tomy was applicated. The operation took 2 hours time. Platelet: 465000/microL WBC: 34800/microL, T: 38.2˚C. and in 12th day it was 15700/microL. vantage for physicians in preoperative evaluation . nosed by talented physicians without wasting time. pendicitis: analysis of its management and outcome. Surgery To day, 37, 762-767. A.M., Knaus, W.A., Schein, R.M. and Sibbald, W.J. guidelines for the use of innovative therapies in sepsis. The ACCP/SCCM Consensus Conference Committee. Care Medicine. Chest, 101, 1644-1655. 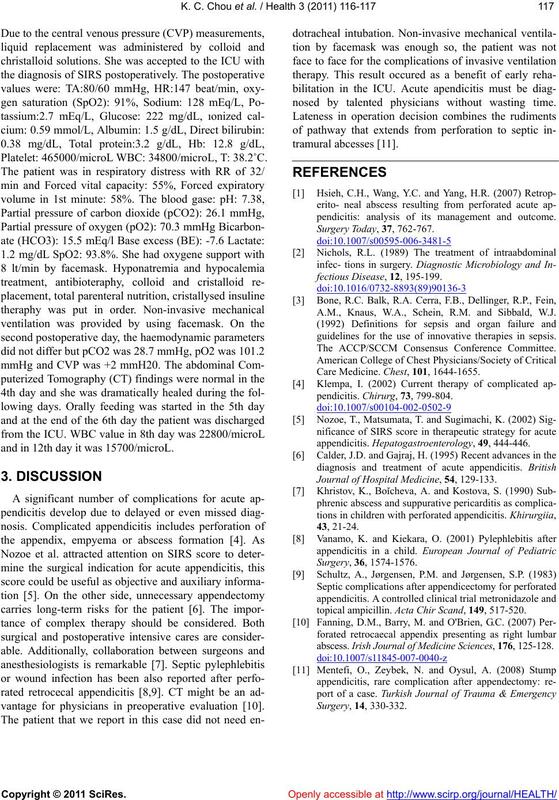 Journal of Hospital Medicine, 54, 129-133.
topical ampicillin. Acta Chir Scand, 149, 517-520.
abscess. Irish Journal of Medicine Sciences, 176, 125-128.